Author of cult classics The Pumpkin Plan and The Toilet Paper Entrepreneur offers a simple, counterintuitive cash management solution that will help small businesses break out of the doom spiral and achieve instant profitability.Conventional accounting uses the logical (albeit, flawed) formula: Sales - Expenses = Profit. The problem is, businesses are run by humans, and humans aren't always logical. Serial entrepreneur Mike Michalowicz has developed a behavioral approach to accounting to flip the formula: Sales - Profit = Expenses. 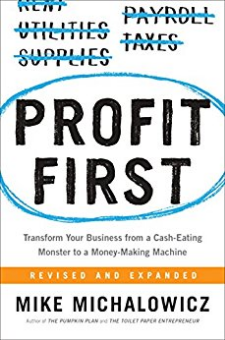 Just as the most effective weight loss strategy is to limit portions by using smaller plates, Michalowicz shows that by taking profit first and apportioning only what remains for expenses, entrepreneurs will transform their businesses from cash-eating monsters to profitable cash cows. Using Michalowicz's Profit First system, readers will learn that:· Following 4 simple principles can simplify accounting and make it easier to manage a profitable business by looking at bank account balances.· A small, profitable business can be worth much more than a large business surviving on its top line.· Businesses that attain early and sustained profitability have a better shot at achieving long-term growth.With dozens of case studies, practical, step-by-step advice, and his signature sense of humor, Michalowicz has the game-changing roadmap for any entrepreneur to make money they always dreamed of.